Theme parks and amusement parks are all about fun. But with admission per person in the hundreds at some of the larger parks and an additional hefty fee for parking -- and that's before you even get in the gates and have to open your wallet for food, souvenirs, and other charges -- funding the fun can be an issue. Order your tickets online, and you’re likely to be rewarded twice: first with a discounted ticket price, and later with quicker entry to the park as you cruise past the long ticket line. Just how much money can you hope to save by shopping online? Quite a bit, actually. On the Universal Studios’ website, you can buy multi-day passes for $20 less than the gate price — and this bargain is far from unique. It's a bit trickier to get discounted tickets to Disney parks, but it's not impossible. Some online re-sellers offer genuine Disney tickets at a discount. However, there also are plenty of counterfeits out there, so do your due diligence and know what you're buying. You'll find that some of these parks offer promotions at certain points in the year. For example, seasonal theme parks (as opposed to those that are open all year long) may offer ticket discounts in the spring. Will your amusement park trip include a hotel stay or a plane trip? If yes, you may want to look into travel packages. Universal and Disney have their own vacation services and can offer a variety of plans with features such as airfare, ground transportation, hotel accommodations (even at hotels away from their properties), theme park admissions and meals. Are they good deals? That depends. During certain low-traffic seasons or at other times when the parks want to drum up business, these can be great values, indeed. Don't book a package that includes features you wouldn't use. Even if a package is not much of a savings over purchasing the bundled items separately, the time and energy you could save with one-stop shopping might make it worth it to you. Some parks will partners with nearby hotels to offer visitors an all-inclusive vacation package, and these bundled deals are often cheaper than the cost of buying all of the parts separately. Do you share a zip code or state with an amusement park? If so, you’ll be pleased to learn that many parks offer a special rate just for locals. 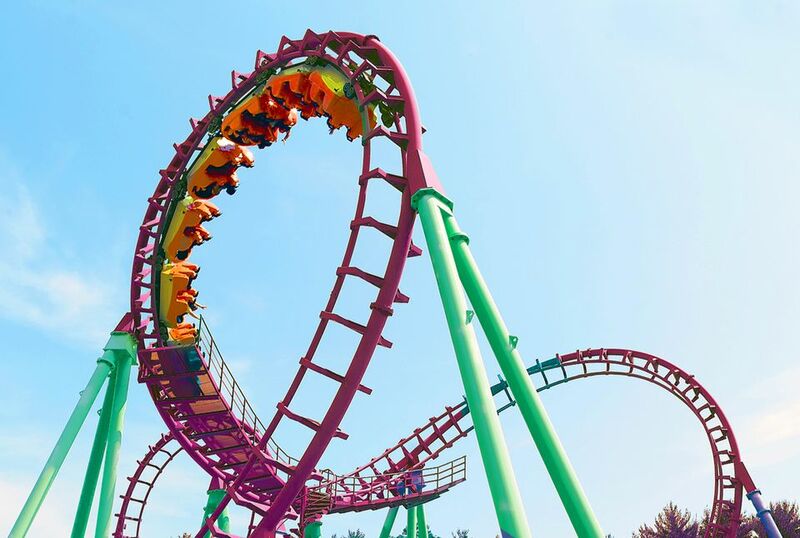 Busch Gardens-Williamsburg offers the option of purchasing a Fun Card, which grants holders spring and summer use of the park for the price of a one-day admission, while Universal Studios offers discounts on everything from park admission to hotel packages. Disney parks also offer cut-rate annual passes to locals. Planning to spend more than one day at an amusement park? Then, you deserve a discount and most parks agree. Dollywood will allow you to add two more days to your trip for just $30 more, and Disney World parks' per-day rates get less expensive when you purchase more days. Some parks, including Sea World, sell tickets that allow you access to two parks for the price of one, while others offer a second day free when you start your first day after a certain time, usually 5 p.m.
Will you be enjoying the park as part of a big group? Then expect big savings. Some parks offer deep discounts for large ticket purchases or will provide extra services for your party like complimentary transport from the airport to the hotel or discounted meal plans. These savings can be hidden on the park's website so be sure to search thoroughly or call the customer service line. Food inside parks can get quite costly. Consider packing a meal and eat it en route or before you enter a park. Many parks have picnic areas outside the entrance. You could take a midday break, and have the lunch you packed. You could also eat at restaurants before or after your park visit. Drinks that you purchase inside the park can really add up too. With all of the walking and time spent in the sun, it's important that you drink a lot. Check the parks for their policies and, if allowed, pack water bottles or bring other drinks into the park. The food stands at most parks will gladly give you complimentary cups of cold water. Just ask. Planning to visit the same park over and over? Then, a season pass could be your biggest source of savings. Calculate how many visits it would take for a pass to pay for itself, and if your number of planned visits exceeds this number, you’ve found a bargain.Some corporate parks, such as Six Flags offer annual passes that are good at all the parks throughout its chain. For an even better deal, see if you can pay a bit more to add free parking to your list of pass holder benefits. Did you know? Many parks will allow you to upgrade your one-day ticket to a season pass for the difference in price between the two. This is a great deal if you want to test-drive a park before committing to a pricey pass. Also try discount travel with Costco. The best way to find park discounts is to contact the park itself. Check the park's website or call its guest services office to inquire about special promotions. Social media: Check parks' twitter feeds, Facebook pages, and other social media for exclusive deals and promotions. Wholesale clubs: Are you a member at BJ's, Costco, or Sam's Club? They frequently offer discounted theme park tickets and bargain travel services. Membership Discounts: AAA and AARP members are eligible for discounted admission rates at many theme parks. Military families, college students, alumni may also be eligible for park discounts so be sure to check those groups' websites as well as the park's websiteCheck your membership benefits. Discounted park tickets and travel packages are frequent perks. Credit card promotions: Don't throw away all of that stuff that comes with your credit card bill without first checking if there are any park offers. Visa, for example, has tie-ins with Disney parks.